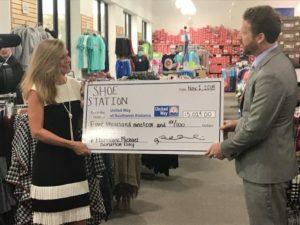 The Shoe Station chain’s fundraiser for Hurricane Michael relief efforts raised $5,519 as the result of shoppers purchasing nearly 5,000 boots, shoes, and sandals in support. Customers online and in 21 Southeastern stores also made additional donations. The fundraiser’s co-sponsor, The Office of Mobile City Council Representative Levon Manzie (District 2), donated $500 to the effort. 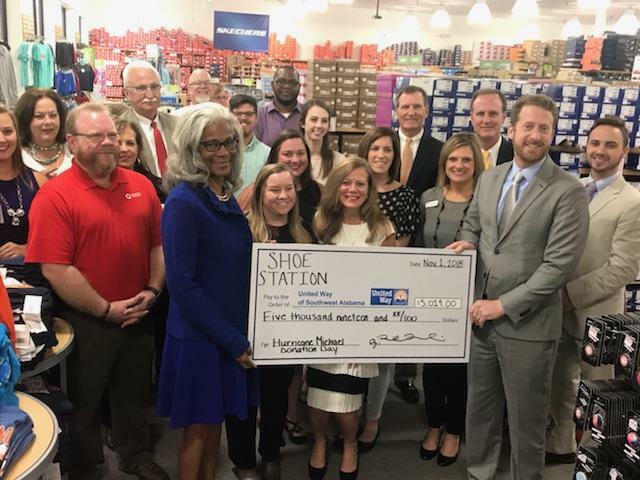 On November 1, Shoe Station is presenting a check to the United Way of Southwest Alabama (#UWSWA). The not-for-profit organization will share proceeds with partner agencies including: American Red Cross, Feeding the Gulf Coast, Lifelines for 211, The Salvation Army, Volunteers for America, and Goodwill Easter Seals. The check presentation event will take place at 10:30 am at Shoe Station’s Hillcrest Road location in Mobile, and is open to media and the general public. Shoe Station’s United Way Day Fundraiser was held October 21, 2018 in the retailer’s 21 locations across the Southeast. UWSWA has had a productive season, as it also received a recent donation for Hurricane Michael relief from UA Plumbers and Pipefitters Local 119 for $5,000. UWSWA serves Choctaw, Clarke, Mobile, and Washington Counties. The vision of UWSWA is to strengthen communities by mobilizing resources in support of the building blocks of a better life: Education, Financial Stability, Health, and Essentials. UWSWA has raised and invested more than $240 million in communities. Shoe Station is one of the nation’s largest independent shoe retailers. The family-owned chain was founded in 1984 in Mobile, Alabama and has a national e-commerce site, www.shoestaton.com. Shoe Station has locations in Florida, Alabama, Mississippi, Louisiana, and Georgia. For more information, visit www.uwswa.org and www.shoestation.com.